Gladiolus plants send up flowers during the summer. Each flower stem contains several buds that bloom along the length of the stem. The flowers are prized as a colorful garden flower and as a cut flower for indoor display. The plants grow from a tender perennial corm that collects and stores the energy necessary for the following year's growth, making it necessary to properly care for the gladiolus after blooming if you want it to flower again the next year. 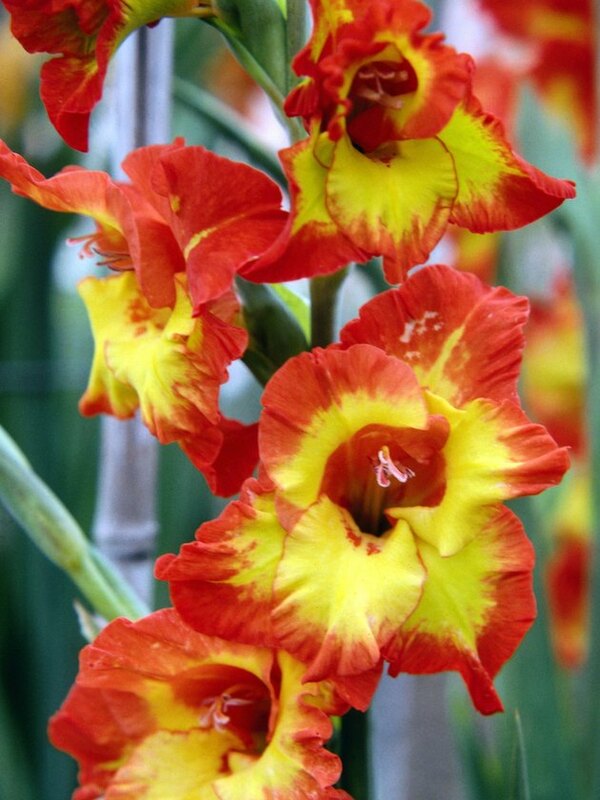 Gladiolus requires proper care even after they stop flowering. Cut off the flower stem at its base after all the buds have flowered and completed blooming. Use clean, sharp shears to remove the stems. Water the plants weekly after blooming. Provide enough water at each irrigation to keep the top 6 inches of soil moist. Water more frequently if hot weather causes the soil to dry out or the plants to wilt. Weed between the gladiolus weekly or as necessary to keep weeds from establishing in the bed. Gladiolus plants can't tolerate weed competition, as the weeds rob the soil of the nutrients and water the corms need to store energy. Cut back the foliage to within ½ inch of the ground after the first fall frost causes the foliage to yellow and die back. Dig the corms up after cutting back the foliage. Spread the corms out in a dry, warm location indoors. Dry the corms for three weeks. Break the bottom off the corm along the seam and discard the bottom portion, saving only the new top corm. Store the corms in a paper bag in a dry location where temperatures are 35 to 45 degree Fahrenheit until spring planting.